It's grapefruit season my friends! That time of year when citrus rules my world, and I am totally under it's thumb. Oranges, satsumas, mandarins, tangelos, ruby grapefruit, yellow grapefruit, lemons..... blah blah blah blah. It's definitely January in Seattle. I'm trying my damnedest to stay away from the January doldrums, but the last week or so it's getting to me. It's just so freakin gray. Dark when I go to work, dark when I leave work. You know the drill. Bright refreshing citrus to the rescue! This salad is super simple, but really really delicious. 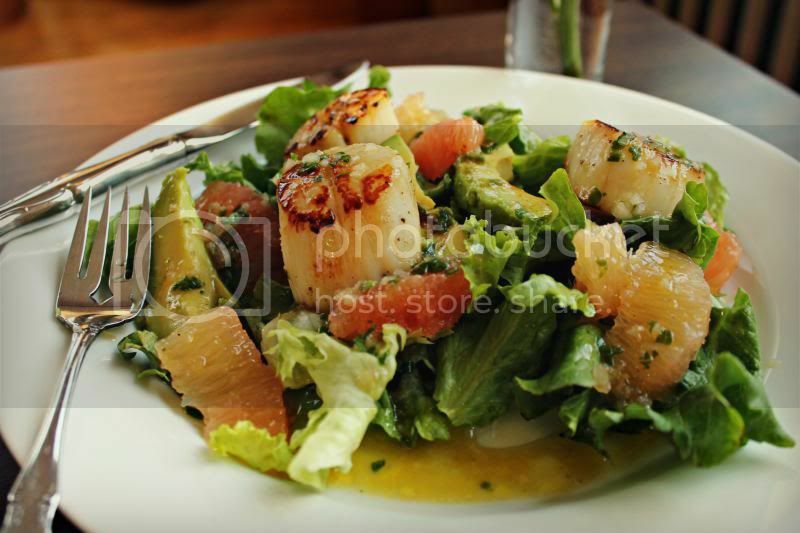 It would be wonderful with just about any seafood, but scallops are da bomb, so scallops we had. 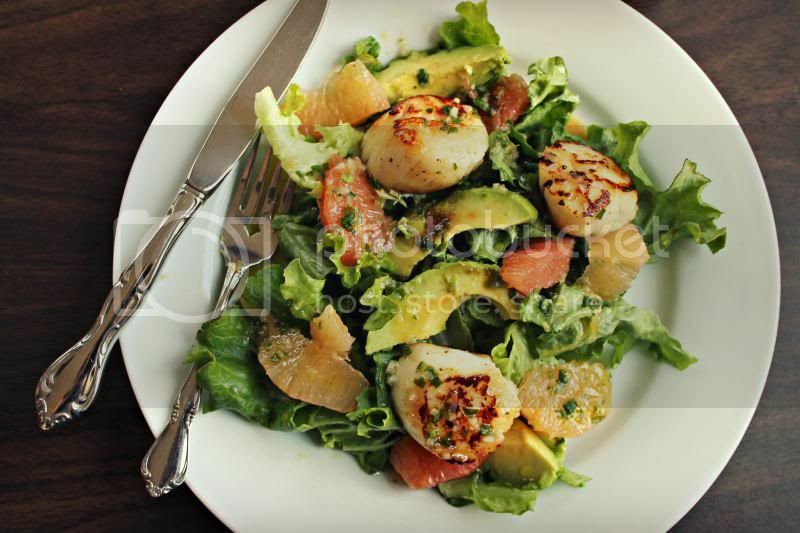 Wash your scallops and pat dry with a paper towel. Season with salt and pepper. Heat a nonstick pan on medium high. While that heats, whisk together the ruby grapefruit juice, vinegar, shallot, green onion, and a generous dash of red pepper and salt and pepper. Whisk in 2 Tbsp olive oil. Heat 1 Tbsp olive oil in your heated nonstick pan on medium high. Place scallops in pan, but don't overcrowd. If you have a small pan, cook in batches of 6. Cook 1 1/2 minutes on each side or until each side has has a golden sear but still translucent in the center. Place 1 1/2 cups lettuce on each of 4 plates. Top with 1/2 an avocado, and 1/4 of both grapefruits. 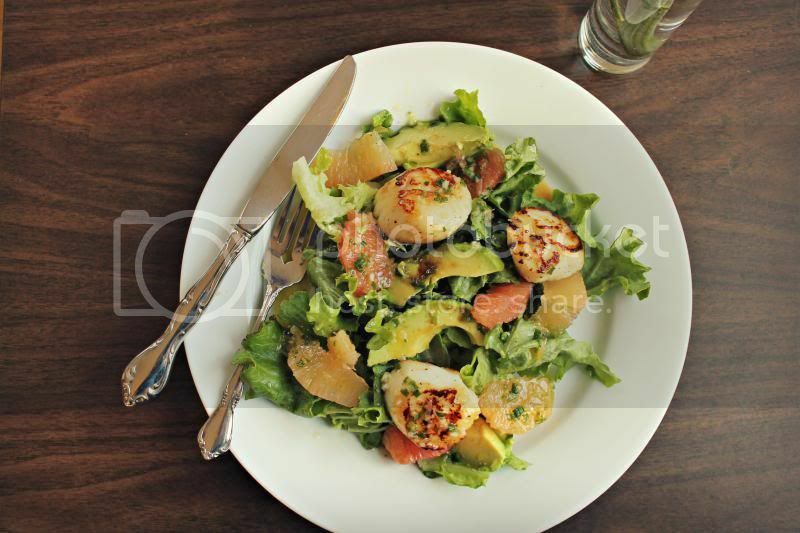 Place 3 scallops on each salad, and drizzle dressing over the top. Any advice on shaking away the January blues? I'd love to hear it!